Walkers are encouraged to participate as long as you are able to finish the course by 2pm. This time limit will be strictly enforced due to traffic concerns. Runners crossing the finish line after 2:15pm will not receive a time. 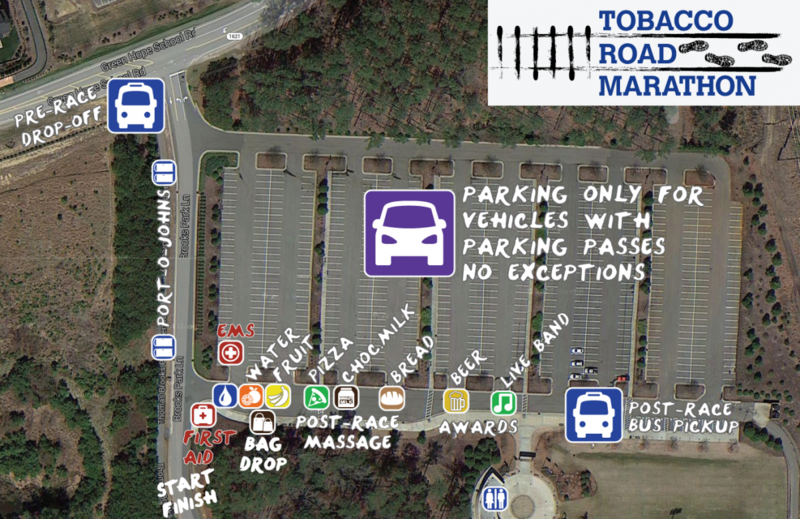 See the full schedule at https://tobaccoroadmarathon.com/schedule. The North Carolina Roadrunner's Club (NCRC) Pace Team provides pace teams/groups for the full and half marathon with the full marathon pace groups matching up to the Boston Qualifying time requirements. It is free to join a pace team so stop by the NCRC Pace Team booth at the pre-race expo to sign up and meet your pacers. Registrants who sign up for the full marathon but choose to only run the half will not receive a finishers time or medal for either race. You must run the race for which you are registered. Please read the FAQs section about Transfers, Switching, & Deferrals for details. If you are registered for the full and do not feel like you can complete it, do NOT turn on to the half marathon course at the split. (The trail does not have capabity/width to accommodate extra runners on the half marathon course.) Instead, keep on the FULL marathon course until you get back to the split and then return to the finish – that will be about 17 miles. Please do not cross the finish line with your race bib; doing so will distort the ranking results for all other runners. You will not receive a time, but you will enjoy the day and sense of accomplishing many miles! It is an enormous effort to clean up after the runners due to the limited access to the trail. There will be garbage containers after every water stop. You may drop your cup on the ground within 100 yards of the stop but If you still have your cup when you pass the garbage can HOLD IT until the next stop. Do not litter gel packs/tops at any time! Drop it in the can or hold it to the next stop! Violators can be disqualified. The start/finish line area can be a busy place on race day. Take a moment to look at the general site map so you know the whereabouts of important things like Bag Check, the start/finish line, post-race food, the awards table, and more. If you are looking for a good spot to meet your family after the race, we recommend you meet in the space beyond the beer garden and music or down the driveway across from where the port-o-johns are located. We do provide a secure Bag Check area on your way to the start/finish line. You must provide your own bag. We recommend something secure with a zipper so that your personal belongings (keys, phone) don't fall out. We will provide tags for you to label your bag with your bib number. While your bag is in an area that is monitored by volunteers and under the supervision of a Tobacco Road Board Member, we do advise against putting valuables in your bag. Tobacco Road is not responsible for lost or broken personal belongings. We have a group of independent, licensed massage therapists on hand after the race ready to help you relax. We highly recommend pre-purchasing a massage at the pre-race expo as priority is given to runners with a pre-purchased massage ($20 for 20 minutes). If you are not able to purchase your massage at the expo, you will be served in the order in which you arrived at the tent. The massage area is located between bag check and the beer garden; you won't be able to miss it!